The Asec 2 Lever Straight Cupboard Lock, is a budget cupboard door lock offering good value for money.with a range of sizes. Operation Deadbolt is locked or unlocked by key. The Asec 2 Lever Straight Cupboard Lock, is a budget cupboard door lock offering good value for money.with a range of sizes. Deadbolt is locked or unlocked by key. Hi guys, my name is Darrel and I'm head of the tech team here at LocksOnline.co.uk. We're doing product reviews today and more importantly, what we have in front of us at this moment in time, we're going to show you lot is the two lever straight cupboard lock. Now, straight cupboard lock means that it's not it's not necessarily fitted into the door, it's upside down here, it actually screws onto the back of a door. The idea is you don't have to mess around with cutting the timber out, etc., like you would with other different types. This one is just basically, you just screw it on the back. And what you'll notice there is that you've got the bolt ejected. Now these are multi-handed so if you wanted it to lock the other way, you'd simply put the key in, like that, and throw it the opposite way. So if the door was opening that way and you wanted to lock it, you could lock it that way, and of course if the door's opening that way, of course you just throw the key over and lock it the other way. So they're non-handed, these are. Now they're available in three different sizes. They're available in 50 millimetres, now the size of these are measured from the height, the length of it. I think it's 50 millimetres. There's one that are 64 millimetres, and this, if my memory serves me right, is the 75 millimetres. Let me just double check that to makes sure. Yeah, I'm bang on the money. Yeah, 75 millimetres. So this is the biggest out of the three that you may want to consider. So what I'll do is, it comes as standard with two keys. That's standard with this particular lock. It's got two levers so a little bit more secure than a one lever, but obviously not as secure as a four lever. One of the other measurements that's quite critical as well if you're thinking of fitting this or you're retrofitting it or you want to replace it, is the measurement from the backset. And from the centre of the keyhole to the end of the lock there it's 19 millimetres. Now obviously the smaller the lock case that you go, the sizes of those would be less as well. 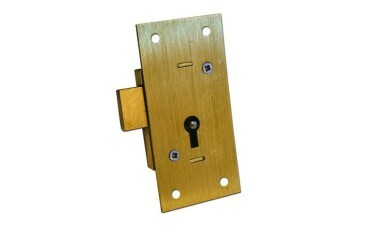 So have a look on our website and you'll see there in the charts the different size lock and the measurements to suit that particular type of lock. Now, what you have to bear in mind also, is that these are all made to modern measurements, and obviously metric measurements. And if you're thinking of replacing one of these with a very old piece of furniture, the chances are the old ones will be imperial. So the chances of you getting one that will actually fit an old imperial measurement bang on, is going to be pretty tight, I've got to be honest with you. I've been in the industry 25 years plus, and I've struggled to try and find ones that will fit right on the money. So that'll be a problem no matter where you go. If you're thinking of fitting this as a new, we also have the ability, I've got one here as well, we've got these nice little rosettes here that we can sell as well. They don't come with the lock, you would need to get one of these as a separate entity. If you're putting a brand new install in, you can fit these little rosettes, and the idea is you drill your hole, you shape it really nice. I'm not that accurate, I could struggle trying to fit this, but . . . and then you would tap that in. It's slightly chamfered, so as you tap it in then, it'll compress at the bottom there and then you've got yourself a lovely little keyhole with a nice brass finial around. So it works out really nice. So without further ado, there's not really much more I can say about this particular lock other than what I've already said now already. 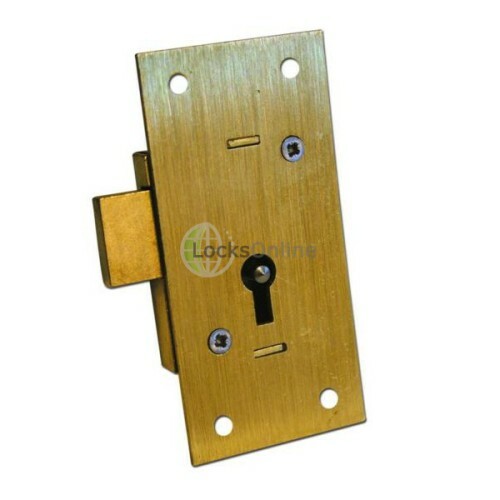 So if you think this is the lock for you, if you want to replace it or it's going to be on a new install or a new venture, perhaps you might want to add to the cart on our website. But in the meantime, that's enough from me. Many thanks. I'm sorry for droning on for so long, and come back and visit us real soon. Take care. Bye-bye now.